Excellent Build Quality & Modern look. This Cape Coral C-shaped table by Christopher Knight Home is a great way to add extra table space to your patio. With its convenient design, you can also use this table as an easy way to hide extra items, such as the small fondue station you are hiding from your SO while you eat strawberries in the summer sun. 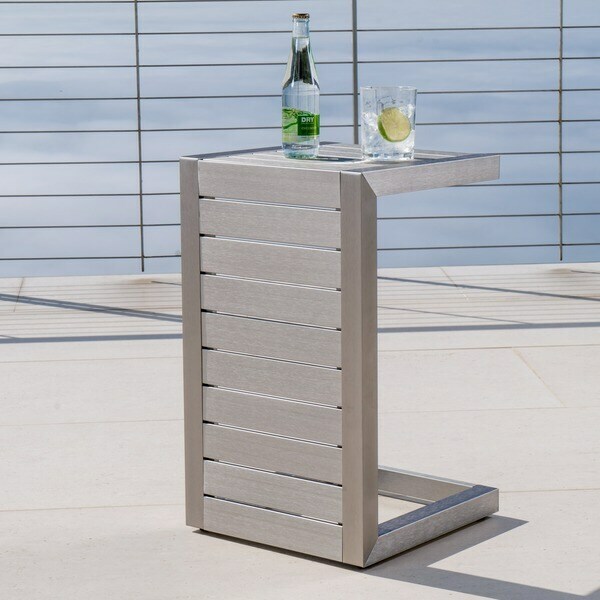 This end table is the perfect addition to your patio sets. I purchased the 3 piece set that came with a table but I wanted an extra one. It's made well and is very contemporary. I'm happy with my purchase. Very attractive with a small footprint. It goes very well with my Cape Coral love seat, chairs and coffee table. As expected, good quality, perfect match! Absolutely perfect. Easy to assemble and a perfect match to my Cape Coral Firepit 5 piece set. The "C" shape is very functional, but I did have a few visitors ask why I had the table "on its side." This table was SUPER easy to put together and looks great! 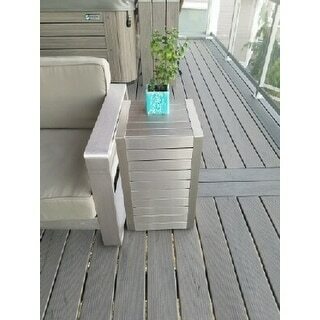 It's very sleek and we use it both as an end table and also as a coffee table when we need on one our patio. I highly recommend this table and we might even get a second one. Great quality, nice finish and should last a long time. I would have given 5 stars but it would have been nice for them to include some extra feet so the table can be turned either to the C-shape or the standard side table. I love the entire Christopher knight collection Cape Coral. High quality! Good prices! And unquie design and look. Everyone loves the modern look the set gives. The piece is built nice and easy to assemble. I purchased this end table to go along with a love seat, two chairs and a coffee table. Perfect addition to the set. I added some felt furniture pads to the ends so I can use it upright as shown or as a small coffee table on its side. It was easy to assemble and looks great with the other pieces on my deck. More of a neutral review, but I am just not too impressed with the production quality of this piece for the price - about 80$. It looks great from a distance, and is a really neat design, but the thin aluminum sheeting and folds are visible when looking more closely. The Chinese manufacturer did just fine in the construction, where the aluminum is cut, and also the many underside welds. The brushed aluminum has some scratches, and I don't know how well it will keep its desired appearance. Wholly-welded or forged aluminum makes great furniture, but this is more of a folded, hollow aluminum piece. It is what it is, and it's a nice design, but in my 2 cents humble opinion, this is more like an Ikea piece with a bit too much mark-up. Can be used upright or as a lower table. I found these end tables nice but not fantastic - especially when compared to other items in the Cape Coral series. They were a bit harder to put together and get all of the sides to line up nicely. One of the two I ordered was also a bit bent and required more finessing on the leveling feet. I do expect it to hold up well given the aluminum construction and they do look nice. Nice End Table! Easy to assemble. First one came missing a part but got a replacement quickly. We bought the entire chair set so this fits well and is durable. The assembly was easy and the shipping was very fast! Thinking about adding another! Nice sturdy piece. However, one of the little rubber pieces was missing that keeps the end table balanced. Other than that, it’s a very nice piece and look just like pictured. These end tables worked well with the 4 chairs we purchased in this collection. They were more stable than I thought they would be based off the photo. The only negative was the inside part was not as finished looking as the outside part you see in the photo. Got two of these to round out the living room set. These are sturdy enough and the different shape is trendy but I wouldn't them again, the metal doesn't hold up outdoors as well as I would have thought. It's spotty and needs constant cleaning. "Is there a table about 36 inch square to match this end table ? I would like to buy a set , but do not need the chairs "
"Which color table should I choose to compliment/match the dark grey lounge chairs item 18342760"
It would match best with SKU # 20633993, as it is a more neutral color of the 3. "Which color should i choose to match the cape coral light grey chaise lounges?" If you are looking to match item number 18342760, I would recommend the silver option. "can this table be flipped to be used as a coffee table, with the 24" side being parallel to the floor? will the sides be sturdy enough to support it as a coffee table rather than as an end table? IF so, will it sit evenly on a level surface? also, what is the WEIGHT of this table?" Yes you can use it this way as well but it has small stopper underneath the side where it is supposed to stay on. Yes, it can be used as a coffee table turned on its side. It weighs about 37 pounds. Yes you can use it as a coffee table. The only thing is, one end will be open and the other end will be solid. It is not heavy at all but it is sturdy. I do not know the specific weight. "can this table be flipped to be used as a coffee table, with the 24" side being parallel to the floor? will the sides be sturdy enough to support it as a coffee table rather than as an end table? IF so, will it sit evenly on a level surface?" Yes, it can be used as a coffee table turned on its side. I think the sides would be sturdy enough, but it wouldn't look right, as one 24" side is open and the other one is slatted. I use it on its side. I put felt pads on the ends of the "C" so that it doesn't get scratched. Works great either way. 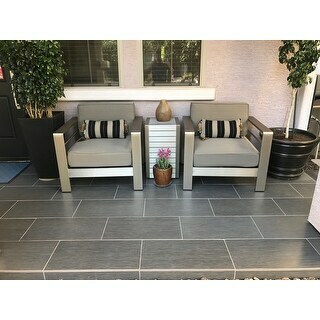 It's a perfect match for the sectional set I just bought and it should fit perfectly in the limited outdoor space I have available. We have 9 of them now, they are great, especially for hot climates! Honestly I don't know 100% if they will or not. I have mine in my patio which is covered however, I have hosed them down and have not rusted. They are made for outside so I would hope not. Maybe ask OT?